National Fire Protection Association standard 110 —the standard for emergency and standby power systems— outlines requirements for the installation and performance of backup power systems in emergency and legally required applications, where an outage would pose a life safety risk. It’s intended to ensure your backup power source is able to provide prompt and reliable power in the event of the failure of your primary power source, minimizing the risk to human life. 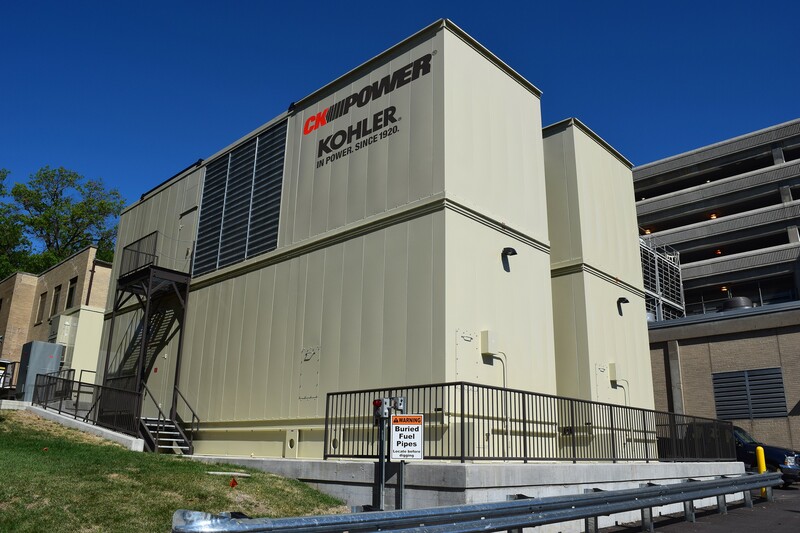 In this article, we’ll explore the installation requirements in NFPA 110, and what to consider when designing and installing your facility’s emergency power supply system (EPSS). In context of NFPA 110, EPSS refers to your functioning backup power system in its entirety. It includes the emergency power supply (EPS) —the generator or other source of electrical power— transfer switches, load terminals and all the equipment required to provide a safe and reliable alternative source of power for your facility (3.3.4). Chapter 7 of NFPA 110 —entitled “Installation and Environmental Considerations”— outlines design considerations intended to reduce the chance of emergency power failure (7.1.2) and describes the installation acceptance testing you need to perform to gain approval for your emergency power supply system (EPSS) installation. Essentially, Chapter 7 provides ways to prevent the disruption of life safety critical loads in case of emergency and outlines the tests required to prove compliance with the authority having jurisdiction (AHJ). AHJ is a broad term referring to the agencies responsible for enforcing code compliance in your city or region. It’s important to note that the NFPA doesn’t certify any equipment or installations. If you want to achieve compliance, you’ll need to reference your manufacturer’s recommendations and work closely with the AHJ in addition to following the standard (7.1.3). Backup power systems aren’t called upon in ideal situations. And your EPSS needs to be designed to kick on in flood, earthquake, fire and storm conditions (A.5.1.1). You should consult with your AHJ early on in the process to make sure you have the equipment, documentation, testing and set-up to guarantee the compliance of your installation. Rather than a prescriptive “how-to” on EPSS installation, this article is dedicated to helping you get a jump-start at understanding the installation design standards in NFPA 110 and the challenges associated with them. Defining the Level of your particular application is outside of the scope of NFPA 110 (1.1.3). There are two EPSS levels defined in the standard: Level 1 and Level 2. Level 1 EPSS systems provide power where failure would result in “loss of human life or serious injuries” (4.4.1). Level 2 EPSS systems carry loads “less critical to human life and safety” (4.4.2). The NFPA recognizes that EPSS’s vary widely by use, application and region (A.4.4), and therefore only give broad recommendations as to applications that might be classified as Level 1 (life safety illumination, elevators, etc.) or Level 2 (sewage disposal, communication systems, etc.) in A.4.4.1-2. As you read Chapter 7, you’ll notice that the installation standards for Level 1 and Level 2 systems are very different. You’ll need to work with your AHJ to define the Level of the loads in your EPSS, and then design your installation around the applicable guidelines. The goal with your EPSS is to provide reliable backup power in case of the failure of your primary power source. Therefore, great care must be taken to ensure all your equipment would be protected and functioning in the case of a fire or natural disaster. Indoor installations If you choose to install your emergency power supply (EPS) inside your facility, you’ll need to put it in a separate room with a 2-hour fire resistance rating (FRR), so that it is better equipped to withstand emergency conditions. You may not have any equipment other than the EPS and EPSS equipment installed in the room (7.2.1.1-3). Outdoor installationsFor outdoor installations, you’ll need to ensure the EPSS is in an enclosure protected from wind, rain and snow. No equipment other than that necessary to set up your EPSS system can be installed within the enclosure. Look to your local building codes for the level of wind and rain resistance you’ll require (7.2.2.1-3). Regardless of whether you install your EPSS equipment inside or outside your facility, your goal should be minimizing damage from emergency conditions such as flooding or sewage backup (7.2.4). You should make every effort to design and locate your equipment in accordance with your AHJ, manufacturer’s recommendations and NFPA 110. Possibly the biggest obstacle to achieving NFPA compliance lies in storing and maintaining the amount of fuel you need for your Class, or duration (in hours) your system must be able to run at its full rated output without refueling (4.2). You’ll need to test the soil in your area to determine your Seismic Design Category (SDC), ranging from A (small seismic risk) to F (very high risk). This, along with your occupation category, will help determine your required class per Table 4.1(a). Areas with higher seismic risk will require a higher Class EPSS. For example, if you live next to a fault, you may be designated Class X, often interpreted as requiring enough fuel for your EPS to run for 96 hours at its full rated output (the kW rating on the generator’s label). Moreover, your fuel tank must be sized to carry 133% of the fuel needed according to your Class (5.5.3). For larger systems, fuel storage poses a great challenge. Let’s say you require 18,000 gallons of fuel to run your EPS for 96 hours because you have a Class X EPSS installation. According to the 133% rule, you need to store almost 24,000 gallons on site. You’ll need to carefully size your fuel tanks and perform regular fuel maintenance to ensure compliance (7.9). You should also consider fuel supplier delivery logistics — if you’re in a rural area where it’s going to take a while to get more fuel if you run out, you might consider oversizing your tank even further. You should work closely with your gen set manufacturer to come up with a fuel storage and maintenance plan that complies with this standard and all applicable codes, without being cost prohibitive. There’s no cut-and-paste way to design an EPSS installation. Carefully read NFPA 110 and talk with your AHJ to make your EPSS installation is compliant with all applicable standards and codes. Your generator manufacturer —if familiar with the provisions in NFPA 110— is another excellent resource to lean on throughout your journey to compliance. For a complete guide to compliance, download our straightforward guide to NFPA 110. Your EPSS is not considered compliant upon installation — you must prove its function and ability to carry all emergency loads (7.13.1) through a series of on-site installation acceptance tests and a two-hour load test (7.13.4.3). You’ll need to notify the AHJ prior to NFPA 110 generator testing so they witness the process (7.13.3). The installation acceptance test begins by transferring a load from the normal power source to the EPSS. In “new and unoccupied buildings,” this means triggering failure of your primary power source by opening the circuit breakers that supply your facility’s primary power (7.13.4.1.1). In an “existing occupied building,” you’ll need to test with a simulated power failure instead (7.13.4.1.2). This will test how your EPSS kicks on in cold start conditions (when it was sitting idle prior to running), similar to how it would have to start in a real emergency situation. For a complete reference of the cold start test, look to NFPA 110 7.13.4.1.4. Testing with a simulated power failure will verify that your EPSS can pick up all emergency loads within the time required by your application — Level 1 usually requires the loads to be transferred to the emergency system within 10 seconds. In addition to testing the transfer equipment at the time of simulated failure, the test will also verify that your EPSS can successfully transfer back to the primary power source within acceptable time limits. After the simulated power failure test, your generator should be allowed to cool for at least 5 minutes before starting the next part of the installation acceptance test: the two-hour load test. The point of the two-hour full load test is to ensure each EPS in your EPSS can handle its full rated output. It also allows your generator manufacturer to authorize the warranty for your equipment. In larger, multi-EPS systems, you’ll need to perform the two-hour load test separately for each generator (7.13.4.3.3). Final acceptance of your installation requires testing as outlined in NFPA 110 7.13. Along with assistance from your generator manufacturer, you’ll test your EPSS installation and ensure it both follows NFPA guidelines and is acceptable to your AHJ. After passing the tests, your equipment will be warranted and commissioned by your AHJ for use as an EPSS. While it provides guidance to design engineers, manufacturers and governing agencies, NFPA 110 is not an all-encompassing manual for the design and implementation of EPSS. To ensure your system is compliant, you’ll need to reference all applicable codes and standards in your area and work closely with all AHJ’s. By familiarizing yourself with the necessary codes —and working with the appropriate state and federal authorities to certify your EPSS— you can be sure your backup emergency power will kick on when you need it most.